and what has been retouched since last update? Request for the next major revision! I am away travelling and will be back after the 18th of September, but don't let that stop you from sending more material! I will edit it into the discographies then! /LF 2005.09.08. I Really should be doing more editing on these discographies as it is so much fun! There has been some very nice additions to the discographies! In all honesty the number one price for best psychedelic poster (or T-shirt) candidate goes to the absolutely Wonderful Les Kamale covers contributed by Martin Sinnock. Other very nice covers are the suite of cultural artifacts in the 45's covers contributed by the ever helpful and generous Paul Johnston. I am also particularily happy to be able to add another suite depicting various scenes and portraits of children kindly supplied by the generous helping hand extended by the knowledgable Ronald Zee. Hope you enjoy and that this inspires all of you to still more glorious contributions and additions. For those of you with more time on your hands or that find this important I hope you could consider making photos and scans also of the labels themselves. I have decided to save my hurting hands a bit more that i will not make a .html interace for just a coverphoto. It will be linked directly to the larger .jpg from the "thumb" of the picture, and not until I also have the backsides and/or the labels, will I make the .html document on the individual record. I REALLY should not be doing this right now, but it seems impossible not to spend a few moments on this since I got so much more fantastic meterial. Please, just let me share with you this beautiful catalogue! Just take a look at this wonderrful document that came to bolingo.org by the kind assistance of Sylvain Konko and Stefan Werdekker. 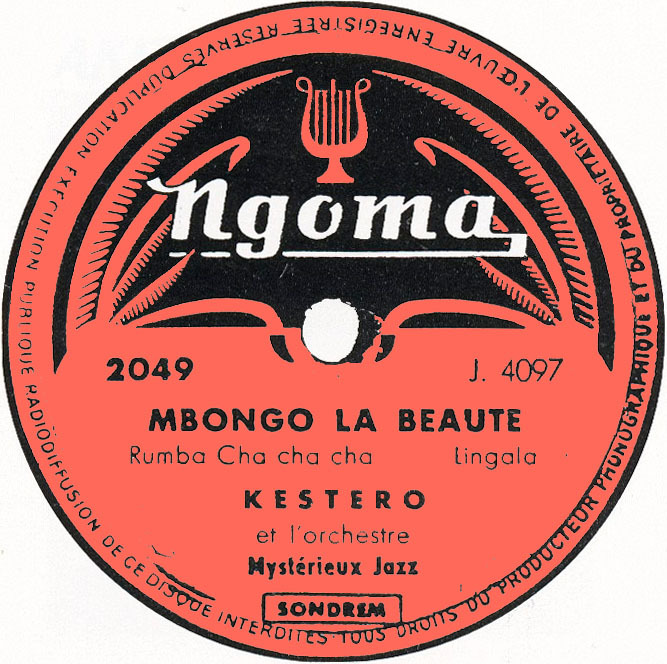 bolingo.org proudly presents the Olympia Catalogue, a catalogue of 78 rpm recordings from the late 1940's. And like Stefan Wedekker says. "This is one to make you weep!" And it is more than enough to make one weep not being able to hear any of the items in the catalogue. If anyone has any of these recordings it is a most meriting action to make them available as. This is endangered audio on the verge of total extinction! Need I say: World Cultural Heritage that ought to be protected. 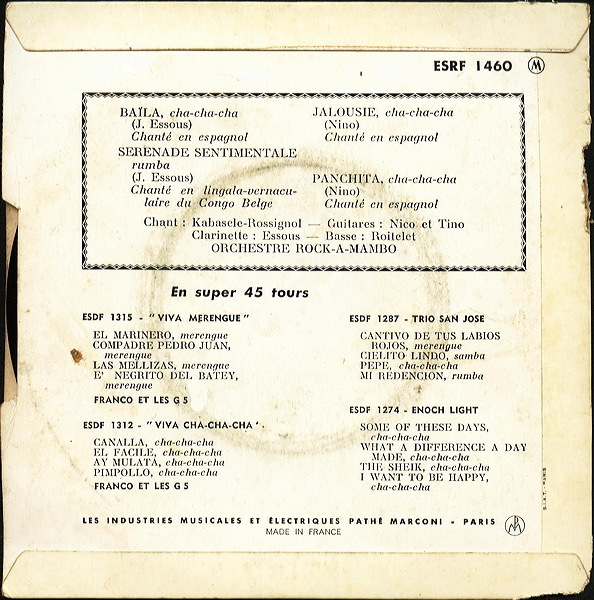 Anyone who has any information about anything pertaining to this catalogue or the Odeon Congolese catalogue please communicate this with bolingo.org! Constant support from Stefan Werdekker brings not only enormous substance to most of the discographies but also well needed quality! Alastair Johnston brought in some good items to the Pathe 45. There were lots of other people that helped and by the looks of it this could turn into a 24 hours a day operation ... Who is complaining? I just say it takes time right... OK?! And then some other important news! I have finally given in and I know that I am working on too many fronts at the same time but that is how I am... I don't see any change in the near future so you will have to bear with me. It may look messy to some but I hope it shall be usefull nevertheless. Too many people were wondering why there were no discographies of the important releases from the labels of Verckys EVVI and VVLP (Alastair do you have any more info on that prefix?) and if I were not going to take on a listing of the Rythmes and Musique REM and ASLP and what about PZL, KL and so on and as I always wanted to make an attempt to deal with them in a coherent way I was thinking that I should wait untill I had a bit more material, but I guess that day will never come and it may in fact be counterproductive as I will not find all that information without your help! Already the good and helpful Miyauchi "Bonobo" Kyosuke (who has some great discografies on among others, Kiam, ) has volounteered to contribute to such an undertaking and I implore you to send any information you find after going through your vast and extensive collections chasing for items to include in such discografies. The first skimpy lists are here but I assure you that they can become quite big if evryone pools in! ALL information, text, covers, catalogues, etc. on EVVI & VVLP as well as REM is most welcome now! What do you think? Should I start at the same time with all the ASLP and PZL? I guess I might as well put what little I have of those to and hope that their mere presence will incite people to send more info seeing how skimpy and meagre they are! I have to explain something that was brought to my attention by the kind and helpful remarks by ljm de Jonge. Click here for samples of what I want to do but have not yet had time to implement more than for some measly samples. This time I am especially greatful to Stephane Rebeschini, "Kyosuke "bonobo" Miyauchi", Anders Hällgren, Ibrahim Genawi, Alastair Johnston and the inexhaustible Stefan Werdekker! Several others have also helped, and contributions made quite some time back have also been added, so i all fairness many more should be mentioned but I thank you all on behalf of all that are benefitting! I am sorry I have not really updated the log as I intended but I found it quite impractical to list each and every addition or correction as was my ambitious plan at the outset. Instead it was prooving to take almost as much time updating the log as it took to do the more needed corrections. I will continue it in a more sketchy way and you who use the pages more often will probably see what happened anyhow. the following is a skimpy shakedown of some of the major additions and changes. b.t.w. don't get too upset about the colour in this one it was more of a joke than any serious attempt to rejunevenate the way some think of discographic work as something dry and booring, and I assure you it will eventually change to something more readable in the near future. Anyhow hope you enjoy what is working! Jack Shoults sent some more beautiful cover scans and some are already in the newly opened gallery. African 360000 series discography had some more items added to it! Since I started these web-based discographies in the early nineties they have finally last year moved to their own domain. Althoug significant amounts of material has accumulated over the years I must admit that I have made much less progress than at first I anticipated. This kind of nitpicking takes significantly more time than one at first imagines. These pages now and then feels a bit messy but I try to devote as much time as I can to making them better and more easy to navigate. Given this and the qualified guess that the future will not look much different it has become evident that some kind of log available to all visitors, to more easily see what ongoing work and additions that were done here without snooping around for hours in the wrong places, I finally gave in and opened this document. I am terribly aware of the many shortcomings and the many loose links and will be most happy to receive your guidance and instructions to amend and make the pages better. Just a few days ago I got one rather short mail "Could you please update your site so that we could make use of it!" Hope it is useful to somebody! For those of you waiting for more vinyl to appear I can only say that it will and any information you send me I will add to the existing discographies but the main work right now is on CD's. /LF 2004.04.11.